The Scourge of India Captains Taking His Usual Regale, W. Wells, 1781, Wellcome Library. For a while I bounced back and forth on whether or not this was a common sailor or an officer. I am inclined toward the latter, but the representation is borderline enough I thought it best to include it rather than neglect it. The short hair suggests a more common sailor, but the clothing has a trend toward officer. What do you think? 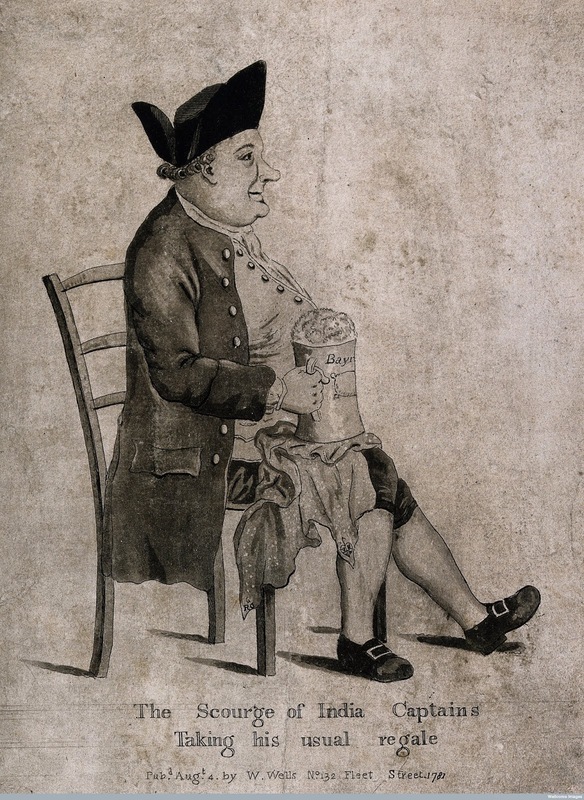 The portly fellow enjoys his "usual regale:" a preposterously large tankard of foaming ale. His plain cocked hat sits with its point forward. His coat has no collar or lapel, but it does have metal buttons and waist pockets. A white cravat or neckcloth is tucked into his white waistcoat, with its flap waist pockets. His blue breeches and white stockings finish out his garb.